The streetlight outlined an unmistakable image as I left for work around 3:40 this morning. 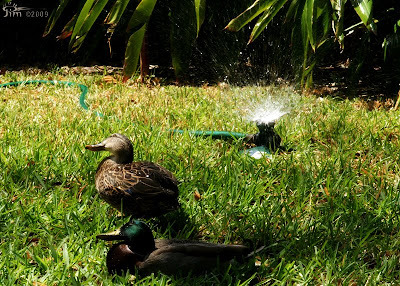 The mallard drake that adopted us to be with his new mate, lay dead in the street in front of our driveway. This year was the first in the past three that our "pet" mallard hen brought a mate to our door. He had been by her side ever since. I cringe at the thought of how close she must have come to being hit too by the uncaring soul who took her mate's life. I thought about her all day, while at work, and worried that she might be injured somewhere. But, as I got home just now, I was greeted by a forelorned quack, as if she was trying to tell me her mate was gone. Darlene and I will repay the joy she has brought us with comfort now and we won't ever forget her handsome gentleman. No one wants to loose a mate. I feel so honored that she has grown to trust us and that he was growing to trust us too. Thanks for writing this, Baby. I feel so bad for her, too. We need to find another mate for her. So sad, I'm sorry for her and you. That is awful, the poor thing. We have a group of 8 sea swans who throughout the years have come to our pier and i have seen the generations pass by. The most heart breaking thing to see is when a swan loses it's partner, usually the swan will die from starvation as they do not want to live. Oh, that is so sad. Such a beautiful creature.